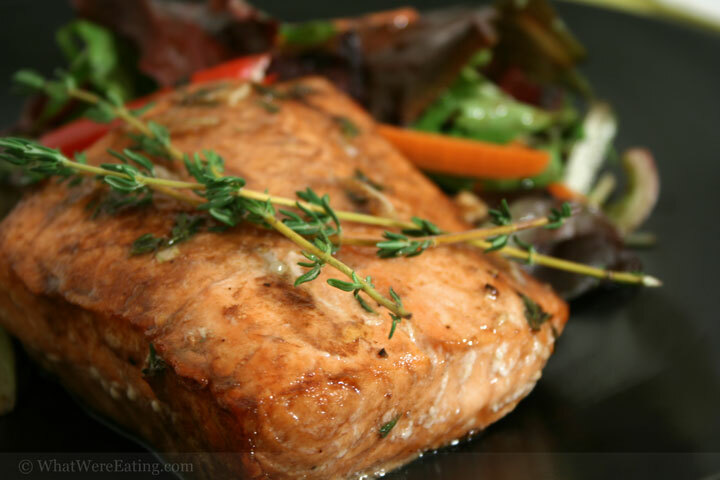 Tonight we’re eating wild salmon marinated in a balsamic and thyme vinegarette. A creamy buttermilk bleu cheese and cauliflower soup accompanies the salmon, along with a salad of baby field greens. Buttermilk Bleu Cheese and Cauliflower SoupT: excellent meal, mandy. A: why thank ya mista tylah! it was well balanced, both healthy AND unhealthy at the same-freakin-time. T: heheheh. I know the salmon was healthy. I take it that soup wasn’t the healthiest thing in the world? A: yup! i mean, it wasn’t the end of the world, but it is a whole milk based soup.. and it uses a roux… and bleu cheeze! oh, and by the way! you’re lucky i’m letting the “mandy” slide buster. most people would get a whoppin’ for that. A: heheh OH OH OH NO YOU DIDN’T! T: you heard me. I said… MANDY! A: well, i’m going to assume you are speaking to a different amanda. 😛 Anyway, i enjoyed every aspect of this meal. It wasn’t a “blow-me-out-the-water” meal, but it was damn good. T: well, I thought it was pretty close to being a “blow-me-out-of-the-water-meal.” I think the weakest part was the salad. The other two elements blew me away. A: awesome. i’ll agree, the salad was the weakest. but i could have used just *slightly* more salt on the salmon, it was perfectly cooked though. The soup rocked my casbah! i really was quite pleased with the outcome of the croutons (my first ever) as well. T: Yes, I agree with everything you just said. I didn’t realize those were your first croutons, though. I thought for sure that you had made some a while back in Baton Rouge. A: nope, pretty sure they were my first. maybe it was garlic bread or something you are thinking of. T: uhh. hmm… oh, well, perhaps I’ve lost a bit of my mind. A: is there really any doubt about that? T: what were we talking about again? T: so, seriously, what were we talking about again? A: how you had lost a bit of your mind! T: oh, yeah. wait, before that! T: ah ha! I still think you have made them before, and that maybe you have lost a bit of your mind! A: nope. i think not. if you can prove your theory… i’ll…. i’ll… i don’t know what i’ll do, but it will be good. i’m just pretty damn certain i’ve not made croutons before. T: so any croutons we had in the past were premade? A: we haven’t eaten croutons in salads in the past. i have made, like, garlic bread, or crispy bruschetta… but no croutons. T: hmm… maybe it was that other amanda. A: hehehe perhaps. mystery solved. so back to the dinner at hand. i give this meal a 4.3/5. if i were simply rating the soup, i might give it something crazy, like a 4.8/5. i really really enjoyed it. i suppose if you don’t like bleu cheese you won’t enjoy it but for me, it was heaven. T: Yeah, i’m a little split with my rating. I want to give the soup a higher rating than anything else. But, i’ll just kind of mash it all together into a rating of 4.56/5. One thing that I enjoyed about this meal, and to the salad’s credit, was eating the red bellpepper at the same time as a bite of salmon. That was fine. A: i actually enjoyed eating all of the salad with bites of salmon because i made a dressing for the salad that was very similar to what the fish was marinated in. they definately worked well together. T: indeed. I loved the skin of the salmon too. Mmm.. I just love that in general. A: man, i thought i was still *really* full until we started this crazy foodblog. T: i’m still *really* full, but that little picture of bread pudding in the web browser is allowing me to see past my fullness. T: to bread pudding, silly! A: hehehe i think i’ll go with a nice hearty stout. T: ahh, grab me one while your at it. A: always. tomorrows dinner is still a mystery to me… it hasn’t revealed itself yet. T: interesting. something to ponder and look forward to! Preheat oven to 375 degrees. Make the marinade by wisking together the first 6 ingredients. Place salmon in a ziploc bag and pour in the marinade. Allow the salmon to marinade for 30 minutes then put on baking sheet and sprinkle lightly with salt and fresh ground black pepper. If you want you can place lemon slices on top of the salmon, if not, no biggy. Bake for 10-20 minutes depending on the thickness of the filet. Serve hot! Trim, then boil, the cauliflower for about five minutes (or a little less) in salted water. Drain the cauliflower, reserving the water it was boiled in. Separate cauliflower into small florets. Make a roux in a medium sized sauce pot with the 3 tbsp butter and 3 tbsp flour. Cook the roux for about 20 seconds then add the diced onions. Saute over low heat, so the roux does not turn brown for five or 6 minutes. While constantly wisking, slowly drizzle in 2 cups of the cauliflower water, if you add the liquid too fast, you will get a lumpy soup. Add the two cups of milk and stir. Add half the cauliflower, and blend with a hand-held immersion blender until smooth. Add the bleu cheese and stir until it is fully melted. If the soup is too think, add more of the cauliflower stock. Taste and season with salt and pepper as necessary. Finally add the reserved cauliflower and stir. Serve with thyme croutons! Melt the butter in a saute pan over med.-low to med. heat. Add bread cubes and toss to coat. Sprinkle with salt and pepper. Allow the bread to cook and get toasty, firm and browned on all sides. Toss in thyme right before the croutons approach a a lovey croutony brown color. If you want, you can toss in some parmesan during the last thirty seconds of cooking. 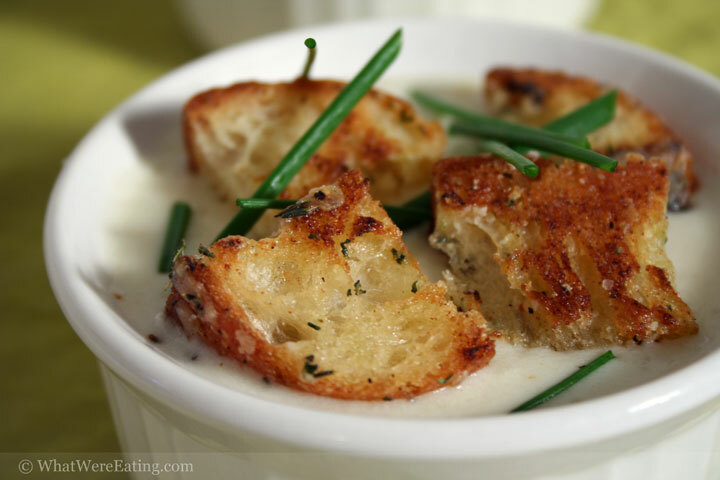 These croutons rock, and go great with soup or salad.. or supersalad. Looks all delicious! Love those little croÃ»tons! I made some yesterday too as a matter of fact, but much simpler version, so I make a note of your recipe! It all looks delicious – especially that soup. Thanks for stopping by Milk & Honey & do try Hodad’s when you get a burger hankering! Thanks Bea! Your blog is always deliciously gorgeous! Thanks for stopping by. Thanks to you too Rorie! You should definately try the soup… it has to be one of the best things i’ve eaten lately. And we will certainly be trying hodads… perhaps tomorrow! I just found your blog — what a great concept. I’ll be back… to read what you’re eating, what you’re thinking about it, and to cop some of these sensational yet simple recipes. Thanks so much for sharing! So we just got done eating salmon that was made from this recipe but with a little improvisation. As “Mandy” knows, payday is two days away so I’m feeling a bit like Old Mother Hubbard but was desperate for a bit of a twist on the usual salmon I make. I substituted brown sugar for the honey, dried thyme for fresh (at half the amount), and used poor man’s dijon (spicy brown). It was pretty good stuff. At times we would start to taste a lot of the basalmic vinegar but just as it was registering the sweetness would take over, a very nice blend. My husband liked it but more than that was happy to have something other than the usual, he doesn’t share my obsession with dill. I cooked it the whole 20 minutes but next time, and there will be a next time, I will probably leave it in slightly longer as the thickest points were just barely done and I like a crispier skin. I give it a solid B.